Thing 2 came home with a birthday party invitation for one of her friends this weekend. Since my parents are coming down to visit this weekend Thing 2 wouldn’t be able to attend and I felt bad for her little friend who is such a sweet girl. “Let’s make her some cupcakes” I suggested out of guilt. Keep in mind – we all just arrived home and it’s already 8:00 PM and we haven’t had dinner yet. Just a glimpse of the glamour filled life I live. 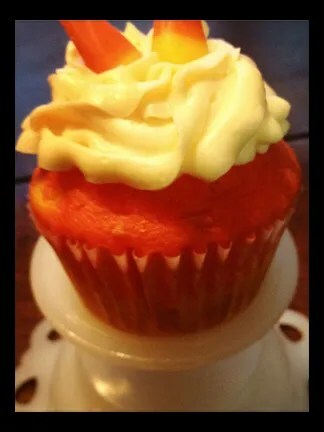 While dinner was cooking – I looked up on Pinterest some Halloween themed ideas for cupcakes and found this cute idea for candy corn cupcakes. These cupcakes capitalized on the trend of differently colored layered batter. Candy Corn Cupcakes were going to happen! 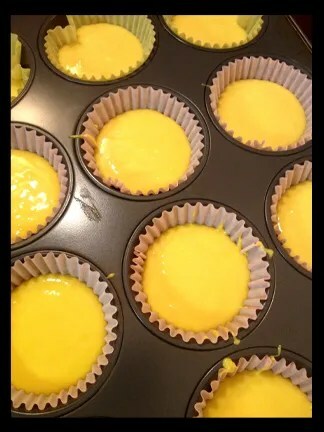 First I added yellow food coloring to the already yellow cake mix – making it more vivid and bright yellow. 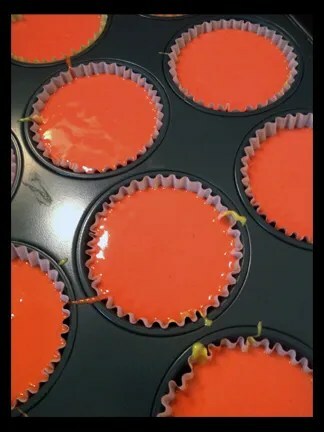 I spooned the batter into the bottom of the cupcake liners. Then I mixed the remaining batter with red food coloring, changing it to a deep pumpkin orange. This is where I switched to a pastry bag. I started cake decorating with I was just 10 years old – learning this great skill from my girl scouts leaders. I still have my original frosting bags – the kind you had to clean and wash after use. The invention of the disposable cake decorating bag is up there on my Top 10 favorite craft items. You can use it for soooo many different things beyond the intended use. It allowed me to carefully piped the orange batter into the liner without disturbing the yellow layer. Then they were popped in my sad excuse of an oven to bake. Thing 2 frosted them in the morning and added a topping of candy corn. Not bad for a last minute idea!